Preheat oven to 375°. Line a 13x9-in. baking pan with parchment paper, letting ends extend up sides; grease paper. In a large bowl, beat melted butter and brown sugar until blended. Beat in eggs and vanilla. In a large bowl, mix flour, baking powder and salt; gradually add to brown sugar mixture, mixing well. Stir in half of the pecans, M&M's, candy corn, pretzels, chocolate chips and butterscotch chips. Spread into prepared pan. Bake 20-25 minutes or until a toothpick inserted in center comes out clean. Cool completely in pan on a wire rack. 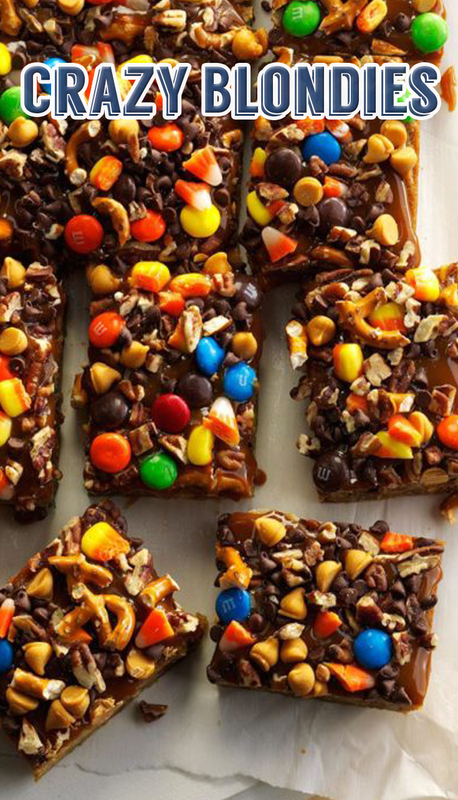 Spread caramel topping over bars; sprinkle with remaining pecans, M&M's, candy corn, pretzels, chocolate chips and butterscotch chips. Lifting with parchment paper, remove from pan. Cut into bars.